Jimmy Carter’s administration began with great promise, but his domestic and foreign policies were met with criticism. President Jimmy Carter took office during a recession, and, though he improved the economy slightly, was unable to end the recession. Carter’s domestic policy involved the creation of the federal Department of Energy and Department of Education, the establishment of a national energy policy, and other various reforms. Carter’s foreign policy was oriented toward the goals of human rights and peace, negotiating an arms reduction treaty with the USSR, and a peace agreement between Israel and Egypt. Carter’s ethos of humility and compassion informed much of his presidency and was reflected in his foreign policy and administration. Carter’s efforts to improve the economy through deregulation largely failed, and his attempt at a foreign policy built on the principle of human rights prompted much criticism. Remaining public faith in Carter was dealt a serious blow when he proved unable to free the American hostages in Tehran. Department of Energy: A Cabinet-level area of government in the United States concerned with U.S. policies regarding energy and safety in handling nuclear material. Soviet Invasion of Afghanistan: A conflict that began in December 1979 when USSR leader Brezhnev deployed troops, starting a 9-year war. Democrat Jimmy Carter served as the 39th President of the United States from 1977 to 1981. As a gifted student and former governor of Georgia, he was relatively inexperienced in politics. His administration sought to make the government “competent and compassionate.” However, in the midst of an economic crisis produced by rising energy prices and stagflation, he met with difficulty in achieving his objectives. The final year of his presidential tenure was marked by several major crises, including the 1979 takeover of the American embassy in Iran, an unsuccessful rescue attempt of the hostages, serious fuel shortages, and the Soviet invasion of Afghanistan. In his inaugural address, Carter stated, “We have learned that more is not necessarily better, that even our great nation has its recognized limits, and that we can neither answer all questions nor solve all problems. ” Carter had campaigned on a promise to eliminate the trappings of the “Imperial Presidency,” and he began taking action according to that promise on the day of his inauguration, breaking with recent history and security protocols by walking up Pennsylvania Avenue from the Capitol to the White House in his inaugural parade. His first steps in the White House went further in this direction: Carter reduced the size of the staff by one-third; canceled government-funded chauffeur service for Cabinet members, ordering them to drive their own cars; and put the U.S.S. Sequoia, the presidential yacht, up for sale. Jimmy Carter’s administration began with great promise, but his efforts to improve the economy through deregulation largely failed. Carter created the United States Department of Education and United States Department of Energy, established a national energy policy, and pursued civil service and social security reform. At the end of his administration, Carter had substantively decreased unemployment and reduced some of the deficit, but the recession ultimately perpetuated. Carter’s ethos of humility and compassion informed much of his presidency and was reflected in his foreign policy and administration. In foreign affairs, Carter initiated the Camp David Accords, the Panama Canal Treaties, and the second round of Strategic Arms Limitation Talks (SALT II). Throughout his career, Carter strongly emphasized human rights; however, this also prompted much criticism, as did his decision to boycott the Summer Olympics in Moscow. On the other hand, he successfully brokered the beginnings of a historic peace treaty between Egypt and Israel. He returned the Panama Canal Zone to Panama amidst criticism at home for his decision, which was seen by many as yet another signal of U.S. weakness and of Carter’s own habit of backing down when faced with confrontation. Remaining public faith in Carter was dealt a serious blow when he proved unable to free the American hostages in Tehran. In the 1980 campaign, presidential candidate Ronald Reagan used the economic problems, Iran hostage crisis, and lack of Washington cooperation to portray Carter as a weak and ineffectual leader. Carter was the first elected president since Hoover in 1932 to lose a reelection bid. James Carter Presidential Portrait: Jimmy Carter served as the thirty-ninth President of the United States from 1977 to 1981. A poor relationship with the Democrats in Congress inhibited Carter’s ability to achieve much of his legislative agenda. Within a couple of years of his taking office, liberal Democrats claimed President Jimmy Carter was the most conservative Democratic president since Grover Cleveland; the relationship between Carter and Congress remained strained throughout his presidency. Carter’s appointee as Director of the Occupational Health and Safety Administration tried to raise health standards for corporations, but many of her reforms aroused opposition and were not enacted. Carter presided over the energy crisis of 1973, addressing energy shortages through a combination of regulation and conservation. a profound but politically unpopular strategy—through speeches and his own sacrifice of luxuries. In July of 1979, Carter gave a speech that came to be known as his “malaise speech” about the energy crisis, attempting to address the “crisis of confidence” among the American public. National Energy Act: A 1978 legislative response by the U.S. Congress to the 1973 energy crisis that included four statutes related to conservation. 1973 Oil Crisis: An event that started in October 1973, when the members of Organization of Arab Petroleum Exporting Countries (OAPEC) proclaimed an embargo on oil, causing its price to quadruple by 1974. Democratic President Jimmy Carter successfully campaigned as a Washington “outsider” critical of President Gerald Ford, as well as the Democratically-controlled U.S. Congress. As president, Carter continued this theme. Despite the early promise of his rhetoric, within a couple of years of his taking office, liberal Democrats claimed Carter was the most conservative Democratic president since Grover Cleveland; ultimately, his refusal to play by the rules of Washington contributed to the Carter administration’s difficult relationship with Congress. During the first 100 days of his presidency, Carter wrote a letter to Congress proposing that several water projects be scrapped. Among the opponents of Carter’s proposal was Senator Russell Long, a powerful Democrat on the Senate Finance Committee. Carter’s plan was overturned and a rift grew between the White House and Congress. Carter wrote that the most intense and mounting opposition to his policies came from the liberal wing of the Democratic Party, which he attributed to Ted Kennedy’s ambition to replace him as president. Carter had problems securing the loyalty of his cabinet, firing five members in 1979 and thus enhancing perceptions that his administration was weak. In trying to manage the relatively high unemployment rate of 7.5 percent and inflation that had risen into the double digits by 1978, Carter was only marginally effective. His tax reform measure of 1977 was weak and failed to close the grossest of loopholes. His deregulation of major industries, such as aviation and trucking, was intended to force large companies to become more competitive. Consumers benefited in some ways; for example, airlines offered cheaper fares to beat their competitors. However, some companies, like Pan American World Airways, instead went out of business. Carter also expanded various social programs, improved housing for the elderly, and took steps to improve workplace safety. Carter wrote in 1982 that Senator Ted Kennedy’s disagreements with his proposed health-care reform plan thwarted Carter’s efforts to provide comprehensive health-care for citizens outside the Medicare system. Some progress was made, however, in the field of occupational health following Carter’s appointment of Dr. Eula Bingham as Director of the Occupational Safety and Health Administration. Bingham drew from her experience as a physiologist working with carcinogens to raise and simplify standards, redirect the office’s resources to industry groups with the worst records, and enact regulations on workers’ rights to know about workplace hazards, including labeling of toxic substances. Bingham enacted many of these provisions over the opposition of not only Republicans, but also some in the Carter Administration itself. Ultimately, many of her proposed reforms were never enacted or were later rescinded. In 1973, during the Nixon Administration, the Organization of Petroleum Exporting Countries (OPEC) reduced supplies of oil available to the world market, in part because of deflation of the dollars they were receiving as a result of Nixon leaving the gold standard, and in part as a reaction to America’s sending of arms to Israel during the Yom Kippur War. This sparked the 1973 Oil Crisis and forced oil prices to rise sharply, spurring price inflation throughout the economy and slowing growth. The U.S. government imposed price controls on gasoline and oil following the announcement, which had the effect of causing shortages and long lines at filling stations for gasoline. The lines were quelled through the lifting of price controls on gasoline, although oil controls remained until Reagan’s presidency years later. Significant government borrowing helped keep interest rates high relative to inflation. Carter told Americans that the energy crisis was “a clear and present danger to our nation” and “the moral equivalent of war,” and he drew out a plan he thought would address it. He attempted to inspire Americans to see the energy and economic problems as related to consumerism and excessive desire in American culture—a profound but politically unpopular strategy—through speeches and his own sacrifice of luxuries. In 1977, Carter convinced the Democratic Congress to create the United States Department of Energy (DoE) with the goal of conserving energy. Carter set oil and natural gas price controls, had solar hot water panels installed on the roof of the White House, had a wood stove installed in his living quarters, ordered the General Services Administration to turn off hot water in some federal facilities, and requested that all Christmas light decorations remain dark in 1979 and 1980. Nationwide, controls were put on thermostats in government and commercial buildings to prevent people from raising temperatures over 65°F in the winter or lowering them below 78°F in the summer. As reaction to the energy crisis and growing concerns over air pollution, Carter also signed the National Energy Act (NEA) and the Public Utilities Regulatory Policy Act (PURPA). The purpose of these watershed laws was to encourage energy conservation and the development of national energy resources, including renewable energy, such as wind and solar energy. Jimmy Carter has been dubbed by many as the “environmentally conscious” president. On December 11, 1980, he signed into law the Comprehensive Environmental Response, Compensation, and Liability Act of 1980 (CERCLA), commonly known as Superfund, a United States federal law designed to clean up sites contaminated with hazardous substances. On December 2, 1980, he signed into law Alaska National Interest Lands Conservation Act. The law provided for the creation or revision of 15 National Park Service properties, and set aside other public lands for the United States Forest Service and United States Fish and Wildlife Service. In all, the act provided for the designation of 79.53 million acres (124,281 square miles; 321,900 km²) of public lands, fully a third of which was set aside as wilderness area in Alaska. When the energy crisis set in, Carter was planning on delivering his fifth major speech on energy; however, he felt that the American people were no longer listening. On July 15, 1979, Carter gave a nationally-televised address in which he identified what he believed to be a “crisis of confidence” among the American people. This came to be known as his “malaise” speech, although Carter himself never uses the word in the speech. Carter leaving Three Mile Island for Middletown, Pennsylvania, April 1, 1979: The Three Mile Island accident was a partial nuclear meltdown that occurred at the Three Mile Island power plant in Dauphin County, Pennsylvania on March 28, 1979. It was the worst accident in U.S. commercial nuclear power plant history, and resulted in the release of small amounts of radioactive gases and radioactive iodine into the environment. Carter’s foreign policies revolved mainly around relations with South Korea, China, the Soviet Union, and the Middle East. President Jimmy Carter ‘s dedication to peace and human rights significantly changed the way that the United States conducted its foreign affairs. During his presidency, Carter tried to greatly reduce the U.S. military presence in South Korea; however, he was prevented by opposition from Congress and the military. The Carter administration officially recognized the People’s Republic of China and its government in Beijing, while relegating its relations with the Republic of China in Taiwan to unofficial status. When the Soviet Union invaded Afghanistan in 1979, the Carter administration supplied the anti-Soviet rebels with billions of dollars in money, arms, and military training. Carter helped facilitate the Camp David Accords, which were part of the Middle East peace process, through comprehensive, multi-lateral negotiations. Carter Doctrine: A policy proclaimed by the U.S. President in 1980, which stated that the United States would use military force if necessary to defend its national interests in the Persian Gulf region. President Jimmy Carter believed that U.S. foreign policy should be founded upon deeply held moral principles and national values. The mission in Vietnam had failed, he argued, because American actions there were contrary to moral values. His dedication to peace and human rights significantly changed the way that the United States conducted its foreign affairs. Carter nominated civil rights activist Patricia M. Derian as Coordinator for Human Rights and Humanitarian Affairs, and in August of 1977, he had the post elevated to that of Assistant Secretary of State. Derian established the United States’ Country Reports on Human Rights Practices, published annually since 1977, and made their findings a factor in military aid determinations, effectively ending such aid for five Latin American countries for the remainder of Carter’s tenure. Carter’s attempt at a foreign policy built on the principle of human rights also prompted much criticism, however. Many in his own administration were opposed to these initiatives, and the more assertive human rights policy of the Carter years was blunted by the discord that ensued between Derian and State Department Policy Planning Director Anthony Lake, who endorsed human rights considerations as an enhancement of U.S. diplomatic effectiveness abroad, and National Security Adviser Zbigniew Brzezinski, who held Cold War considerations as paramount. In 1982, though he had met with mixed results during his presidency, Carter established the Carter Center in Atlanta to advance human rights and alleviate human suffering. The non-profit, nongovernmental center promotes democracy, mediates and prevents conflicts, and monitors the electoral process in support of free and fair elections. It also works to improve global health through the control and eradication of diseases. During his first month in office, President Carter cut the defense budget by $6 billion. One of his first acts was to order the unilateral removal of all nuclear weapons from South Korea, and announce his intention to cut back the number of U.S. troops stationed there. Carter planned to remove all U.S. troops, with the exception of 14,000 U.S. Air Force personnel and logistics specialists, from South Korea by 1982; however, after cutting only 3,600 troops, he was forced by intense congressional pressure, as well as strong opposition from the military generals, to abandon the effort in 1978. During his presidency, Carter continued the policy of Richard Nixon to normalize relations with the People’s Republic of China. National Security Advisor Zbigniew Brzezinski and China expert Michel Oksenberg laid the groundwork for granting the People’s Republic of China full diplomatic and trade relations. In the Joint Communiqué on the Establishment of Diplomatic Relations, dated January 1, 1979, the United States transferred diplomatic recognition from Taipei to Beijing. The U.S. reiterated the Shanghai Communiqué’s acknowledgment of the Chinese position that there is only one China and that Taiwan is a part of China; Beijing acknowledged that the American people would continue to carry on commercial, cultural, and other unofficial contacts with the people of Taiwan. The U.S. unofficially recognized Taiwan through the Taiwan Relations Act. A key foreign policy issue Carter worked laboriously on was the second Strategic Arms Limitation Treaty (SALT II), which reduced the number of nuclear arms produced and/or maintained by both the United States and the Soviet Union. Carter and Leonid Brezhnev, the leader of the Soviet Union, reached an agreement on the treaty in 1979 despite opposition in Congress to its ratification, as many thought it weakened U.S. defenses. Following the Soviet invasion of Afghanistan late in 1979, however, Carter withdrew the treaty from consideration by Congress and the treaty was never ratified (though it was signed by both Carter and Brezhnev). Even so, both sides honored the commitments laid out in the negotiations. 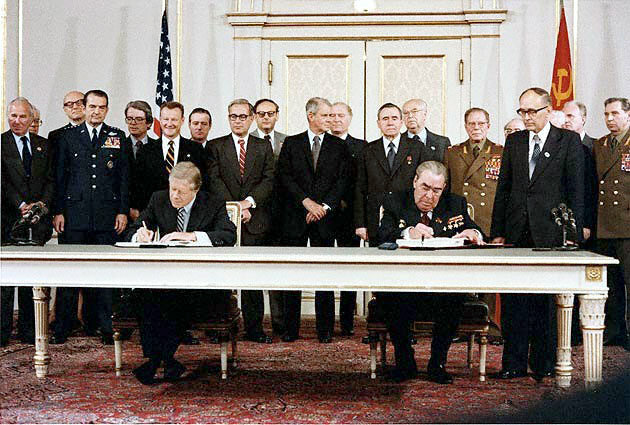 Carter and Brezhnev Sign SALT II: President Jimmy Carter and Soviet General Secretary Leonid Brezhnev sign the Strategic Arms Limitation Talks (SALT II) treaty, June 18, 1979, in Vienna. Carter insisted that what he termed “Soviet aggression” in Afghanistan could not be viewed as an isolated event of limited geographical importance, but had to be contested as a potential threat to U.S. influence in the Persian Gulf region. After the invasion, Carter announced what became known as the Carter Doctrine—that the U.S. would not allow any other outside force to gain control of the Persian Gulf. He terminated the Soviet Wheat Deal in January 1980, which was intended to establish trade with the Soviet Union and lessen Cold War tensions. The U.S. was also worried about the Soviet Union gaining access to the Indian Ocean through arrangement with Pakistan, in which the Soviet Union provided Pakistan with aid in collecting intelligence. The United States, via the CIA, purchased all of Israel’s captured Soviet weapons clandestinely, and then funneled the weapons to the Mujahideen fighter in Afghanistan. The U.S. aid was supplied to Islamic fundamentalists and to the military government of Pakistan, which may have contributed to the subsequent political instability and rise of Islamic theocracy in the region. The Camp David Accords were the result of 18 months of intense diplomatic efforts by Egypt, Israel, and the United States that began after Jimmy Carter became president. The efforts were initially focused on a comprehensive resolution of disputes between Israel and the Arab countries, and gradually evolved into a search for a bilateral agreement between Israel and Egypt. The Accords were signed by Egyptian President Anwar El Sadat and Israeli Prime Minister Menachem Begin on September 17, 1978, following thirteen days of secret negotiations at Camp David in the United States. The two framework agreements were signed at the White House and were witnessed by United States President Jimmy Carter. There were two 1978 Camp David agreements: “A Framework for Peace in the Middle East” and “A Framework for the Conclusion of a Peace Treaty between Egypt and Israel.” The agreements and the peace treaty were both accompanied by “side-letters” of understanding between Egypt and the U.S., and Israel and the U.S. The first part of the agreement, “A Framework for Peace in the Middle East,” provided a plan for Palestinian self-government; however the vague language left this issue undecided to become the primary point of Arab-Israeli contention. The second part of the agreement, “A Framework for the Conclusion of a Peace Treaty between Egypt and Israel,” provided that Israel return the Sinai Peninsula to Egypt, and evacuate Israeli inhabitants in exchange for diplomatic recognition and other guarantees. This led directly to the 1979 Egypt-Israel Peace Treaty and resulted in Sadat and Begin sharing the 1978 Nobel Peace Prize. The U.S. also committed several billion dollars in annual subsides to Egypt and Israel, which continue to the present-day. The Camp David Accords left Egypt, formerly a leading regional power, ostracized by other Arab countries, who criticized Egypt’s concessions to Israel and Egypt’s arrogance in speaking unilaterally for Jordan and Palestine. The Accords also demonstrated to Arab states that direct negotiations with Israel were possible, setting up future attempts at diplomacy by the Palestine Liberation Organization (PLO), Jordan, and others. Jimmy Carter’s administration began with great promise, but his efforts to improve the economy through deregulation largely failed. Evaluate the ups and downs of the economy during the Carter Administration, including the effects of the energy crisis. Early in his administration, Carter presided over accelerated growth, declines in unemployment, and increases in private investment.The Energy Crisis of 1979 caused higher inflation and interest rates, and ended the three year period of economic recovery. Chairman of the Federal Reserve Board Paul Volcker, a Carter appointee, successfully lowered the inflation rate through his monetary policy, most notably raising the Federal Fund Rate. On March 14, 1980, Carter enacted an austerity program, including credit controls, which contributed to the recession in the spring of 1980, and to Carter’s overwhelming defeat in the election of 1980. Carter was generally fiscally conservative, vetoing many spending increases and deregulating sectors of the economy, though the federal deficit remained high throughout his presidency. Federal Reserve Board: The main governing body charged with overseeing the 12 District Reserve Banks, and with helping implement U.S. national monetary policy. Federal Deficit: The United States public debt; the money borrowed by the government of the United States at any one time through the issue of securities by the Treasury and other federal government agencies. Energy Crisis of 1979: An event of major oil shortages in the United States that occurred in the wake of the Iranian Revolution, which disrupted Iranian oil production and export. The U.S. economy, which had grown by 5% in 1976, continued to grow at a similar pace during 1977 and 1978. Unemployment declined from 7.5% in January 1977 to 5.6% by May 1979, with over nine-million net new jobs created during that interim; in addition, real median household income grew by 5% from 1976 to 1978. The recovery in business investment in evidence during 1976 strengthened as well. Fixed private investment (machinery and construction) grew by 30% from 1976 to 1979, home sales and construction grew another one third by 1978, and industrial production, motor vehicle output, and sales did so by nearly 15%. The 1979 energy crisis ended this period of growth, however. As both inflation and interest rates rose, economic growth, job creation, and consumer confidence declined sharply. The relatively loose monetary policy adopted by Federal Reserve Board Chairman G. William Miller had already contributed to somewhat higher inflation, rising from 5.8% in 1976 to 7.7% in 1978. The sudden doubling of crude oil prices by OPEC, the world’s leading oil exporting cartel, forced inflation up even higher, averaging 11.3% in 1979 and 13.5% in 1980. The sudden shortage of gasoline as the 1979 summer vacation season began exacerbated the problem, and would come to symbolize the crisis among the public in general. Jimmy Carter’s administration began with great promise, but his efforts to improve the economy through deregulation largely failed. Like Nixon before him, Carter asked Congress to impose price controls on energy, medicine, and consumer prices; however, he was unable to secure passage of such measures, due to strong opposition from Congress. One related measure approved by Congress during the presidency of Gerald Ford, the Energy Policy and Conservation Act of 1975, gave presidents the authority to deregulate prices of domestic oil. Carter exercised this option on July 1, 1979, as a means of encouraging both oil production and conservation. Oil imports, which had reached a record 2.4 billion barrels in 1977 (50% of supply), declined by half from 1979 to 1983. Following an August 1979 cabinet shakeup in which Carter asked for the resignations of several cabinet members, Carter appointed G. William Miller as Secretary of the Treasury, naming Paul Volcker as Chairman of the Federal Reserve Board. Volcker pursued a tight monetary policy to bring down inflation, which he considered his mandate. Volcker succeeded, but only by first going through an unpleasant phase during which the economy slowed and unemployment rose. Inflation did not return to low single-digit levels until 1982, during a second, more severe recession. The policy, along with record interest rates, would lead to a sharp recession in the spring of 1980. The sudden fall in gross domestic product (GDP) during the second quarter caused unemployment to jump from 6% to 7.5% by May, with output in the auto and housing sectors falling by over 20% to their weakest level since the 1975 recession. Carter phased out credit controls in May, and lower interest rates and easing of credit controls sparked a recovery during the second half of 1980. Although the hard-hit auto and housing sectors would not recover substantially, GDP and employment totals regained pre-recession levels by the first quarter of 1981. The Carter Administration remained fiscally conservative during both growth and recession periods, vetoing numerous spending increases while enacting deregulation in the energy and transportation sectors and sharply reducing the top capital gains tax rate. The V-shaped recession coincided with Carter’s reelection campaign in 1980, however, and contributed to his unexpectedly severe loss. 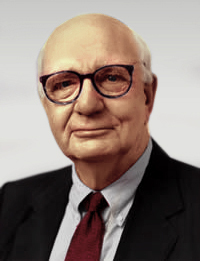 Paul Volcker: Paul Volcker, former Chairperson of the President Carter’s Economic Recovery Advisory Board. The Iranian hostage crisis was a diplomatic crisis between Iran and the United States in which 52 Americans were held hostage for 444 days. Explain the background, resolution, and aftermath of the Iranian Hostage Crisis. Shah Pahlavi, the ruler of Iran, was a key ally of the United States and beneficiary of American aid; however, he was largely unpopular among citizens of Iran due to his brutal policies. In 1953, the shah was restored to power in a coup, organized by the CIA, which overthrew a democratically elected government and instated an absolute monarchy. The Iranian Revolution overthrew the shah in 1979, and led to the establishment of the Islamic Republic under Ayatollah Khomeini. As a form of resistance to U.S. involvement and manipulation in Iranian politics, as well as its support for the shah, Iranians seized the American embassy in Iran and took 52 Americans hostages in November 4, 1979. Carter’s negotiations with the Iranian activists failed to free them, and the episode reached a climax when the U.S. military attempted a failed rescue operation in April of 1980. The 52 remaining hostages were formally released into United States custody on January 20, 1981, the day after the signing of the Algiers Accords, and just minutes after the new American president, Ronald Reagan, was sworn into office. Mohammad Reza Pahlavi: The last shah of Iran, ruling from September 16, 1941 until his overthrow by the Iranian Revolution on February 11, 1979. Iranian Revolution: Events involving the overthrow of Iran’s monarchy under Shah Mohammad Reza Pahlavi, and its replacement with an Islamic republic under Ayatollah Ruhollah Khomeini, the leader of the revolution. Ayatollah Khomeini: An Iranian religious leader and politician and the leader of the 1979 Iranian Revolution, which saw the overthrow of Mohammad Reza Pahlavi, the shah of Iran. Following the revolution, he became the country’s Supreme Leader, a position created in the constitution as the highest ranking political and religious authority of the nation, which he held until his death. President Carter’s biggest foreign policy problem was the Iranian hostage crisis, whose roots lay in the 1950s. In 1953, the United States had assisted Great Britain in the overthrow of Prime Minister Mohammad Mossadegh, a rival of Mohammad Reza Pahlavi, the shah of Iran. Mossadegh had sought greater Iranian control over the nation’s oil wealth, which was claimed by British imperialist companies. Following the coup, Shah Pahlavi assumed complete control of Iran’s government. He then disposed of political enemies and eliminated dissent through the use of SAVAK, a secret police force trained by the United States. The United States also supplied the shah’s government with billions of dollars in aid. As Iran’s oil revenue grew, especially after the 1973 oil embargo against the United States, the pace of its economic development and the size of its educated middle class also increased, and the country became less dependent on U.S. aid. Its population increasingly blamed the United States for the death of Iranian democracy, and criticized its consistent support of Israel. Despite the shah’s unpopularity among his own people, the result of both his brutal policies and his desire to westernize Iran, the United States supported his regime. In February of 1979, the shah was overthrown when revolution broke out, and a few months later, he departed for the United States for medical treatment. The long history of U.S. support for him, and its offer of refuge, greatly angered Iranian revolutionaries. On November 4, 1979, a group of Iranian students and activists, including Islamic fundamentalists who wished to end the westernization and secularization of Iran, invaded the American embassy in Tehran and seized 66 embassy employees. The women and African Americans were soon released, leaving 53 white men as hostages. Another hostage was released when he developed serious medical problems. Carter’s negotiations with the Iranian activists failed to free them. The episode reached a climax when the United States military attempted a rescue operation off the U.S.S. Nimitz, an aircraft carrier. On April 24, 1980, Operation Eagle Claw resulted in a failed mission, the deaths of eight American servicemen and one Iranian civilian, and the destruction of two aircrafts. developed serious medical problems. On July 27, 1980, the former shah died; then, in September of 1980, Iraqi President Saddam Hussein launched an invasion of Iran. These two events led the Iranian government to enter into negotiations with the U.S., with Algeria acting as a mediator. The 52 remaining hostages were formally released into United States custody on January 20, 1981, the day after the signing of the Algiers Accords, a deal brokered by Algeria between America and Iran, just minutes after the new American president, Ronald Reagan, was sworn into office. The Release of the Hostages: The 52 American hostages return from Iran in January 1981. They had been held for 444 days. In Iran, the taking of hostages was widely seen as an act of resistance against U.S. influence in Iran, its attempts to undermine the Iranian Revolution, and its longstanding support of Shah Pahlavi of Iran, who had been recently overthrown by the revolution. In the United States, the hostage situation was seen as an outrage that violated international law granting diplomats immunity from arrest and diplomatic compounds’ inviolability. The crisis has also been described as the “pivotal episode” in the history of Iran–United States relations. In the United States, some political analysts believe the crisis was a major reason for U.S. President Jimmy Carter ‘s defeat in the November 1980 presidential election. In Iran, the crisis strengthened the prestige of the Ayatollah Khomeini and the political power of those who supported theocracy and opposed any normalization of relations with the West. The crisis also marked the beginning of U.S. legal action, or economic sanctions, against Iran, which further weakened economic ties between Iran and the United States. The hostage situation, in some respects, was unsuccessful for the Islamic Republic. Iran lost international support for its war against Iraq, and the settlement was considered almost wholly favorable to the United States, since it did not meet any of Iran’s original demands. However, the crisis strengthened both anti-Iranian (and more broadly, anti-Islamic) sentiment in the U.S. and anti-American sentiment in Iran.